FOR IMMEDIATE RELEASE [October 31, 2018 | Mesa, CO] – Powderhorn Mountain Resort owners Andy Daly and Ken, Tom and John Gart of The Gart Companies are strengthening their commitment to the independently owned resort’s success by bringing on ZOMA Capital of Denver as an investment partner and entering into an operating lease with Pacific Group Resorts Inc. (PGRI) from Park City, Utah. Powderhorn is bringing on ZOMA Capital as an equity partner to augment the extensive capital improvements that have been completed since 2011 and further enhance the resort’s summer and winter experience. Specific capital expenditures and details about the improvements will be announced over the course of this winter as plans are finalized. The recent designation of the Grand Mesa as an Opportunity Zone is particularly exciting and may be leveraged for incremental investment dollars as Daly, the Garts and ZOMA Capital seek to continue to support the regional economic vitality of the Grand Valley. “This season, Powderhorn introduced the innovative Mission: Affordable season pass program which has been a smashing success, bringing thousands of new customers to Powderhorn for affordable skiing,” said Andy Daly. To continue this momentum, the resort has entered into a long-term lease with PGRI, which will position Powderhorn more effectively for the future. PGRI also owns and operates Ragged Mountain in New Hampshire, Wisp Resort in Maryland, Wintergreen Resort in Virginia, and Mount Washington Alpine Resort in British Columbia, Canada. PGRI’s Mission: Affordable season pass program was created to make skiing more affordable for families. Since Powderhorn’s adoption of the 2018-19 Mission: Affordable season pass in spring 2018, the resort has already seen dramatic growth in season passes. Notably, 55 percent of sales have been to new pass holders. In addition to passes, the Mission: Affordable Learn to Ski Free program will be introduced this winter and will provide greatly expanded accessibility for brand-new skiers and snowboarders. Fischer explained there is a further PGRI connection to the Colorado ski community noting that the president and CEO of PGRI, Vern Greco, is originally from Denver and has deep roots in the region having served in the past as president and CEO of Steamboat Resort and Durango Mountain Resort as well as chairman of Colorado Ski Country USA. The changes and future planned developments at Powderhorn, including the Palisade Plunge mountain biking trail extending 32-miles from Powderhorn to Palisade, position the resort and Grand Mesa for continued growth. “We are deeply appreciative of the incredible support we’ve experienced since becoming part of the Grand Valley in 2011, and in particular, we want to share our appreciation for Home Loan State Bank who has been a terrific partner in supporting us in this next step of our progress,” said Daly. Powderhorn received transaction advisory support from Josh Fox with Stout Investment Bank’s Real Estate Lodging and Leisure division. Powderhorn is nestled deep in the heart of the Grand Mesa on the storied Western Slope of Colorado. For 51 years, Powderhorn has been a scenic, family-friendly resort featuring 1,600 acres of terrain suited to a variety of abilities and preferences. 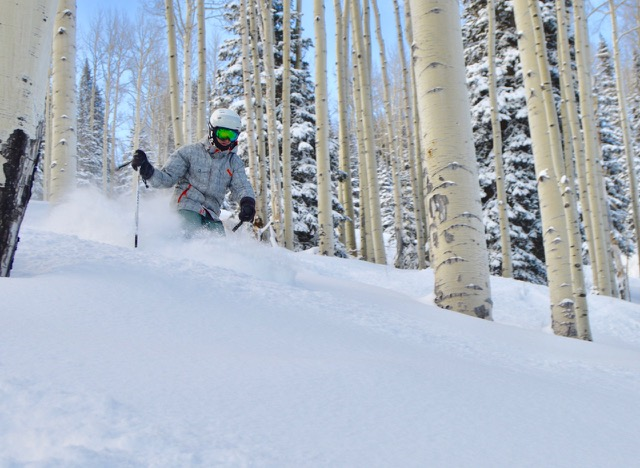 Powderhorn is known for extending exceptional value to each guest, thanks to improvements at the resort and a mountain focused on creating a one-of-a-kind, year-round experience. Visitors choose Western Colorado for its wide-open spaces, distinctive topography and friendly local residents. To learn more about Powderhorn Mountain Resort, visit www.powderhorn.ski or call (970) 268-5700. The Gart Companies is a multifaceted, privately held corporation comprised of two main divisions, Gart Properties and Gart Capital Partners. Gart Properties acquires, develops and manages a vast array of real estate holdings. Gart Capital Partners is a growth investment partnership specializing in management buyouts and recapitalizations of high-quality companies with strong market positions and/or growth potential. The Gart Companies continues to grow and expand as new opportunities are identified and developed. Pacific Group Resorts, Inc. (PGRI) is an international resort operating company based in Park City, Utah whose portfolio includes Wintergreen Resort in the Blue Ridge Mountains of Virginia, Wisp Resort in the Appalachian Mountains of western Maryland, Ragged Mountain in the White Mountains of New Hampshire, Mt. Washington Alpine Resort on Vancouver Island, British Columbia, Canada, and now Powderhorn Mountain Resort on the Grand Mesa of western Colorado. An affiliate of PGRI, Salt Lake City based Pacific Group U.S. and its affiliates have been instrumental in the development and/or construction of portions of the base villages at numerous leading mountain resort properties including Whistler in British Columbia, Mammoth Mountain and Squaw Valley in California, Copper Mountain in Colorado, and Solitude Resort in Utah. Additionally, Pacific Group has been active in commercial real estate acquisition, development, and construction with over 1,000 successfully completed projects. These projects include some of the top resort properties in North America plus student housing, commercial office buildings, retail stores and centers, industrial business parks, multi-family urban condominium properties, and master planned resort communities. For more information on Pacific Group Resorts, Inc., please visit www.pgri.us. ZOMA Capital is the investment arm of the family office of Ben and Lucy Ana Walton, based in Denver. ZOMA Capital invests in a broad range of market-based sustainable solutions advancing energy, water and regional economic resiliency in Chile and Colorado. Its global investment portfolio spans multiple asset classes and sectors with an emphasis on addressing environmental and social challenges. To learn more, visit https://ZOMAlab.com/ZOMA-capital/. Stout’s Investment Banking Group provides mergers and acquisitions (M&A) advice, private capital raising, and other financial advisory services for private equity portfolio companies, closely held or family-owned businesses, and divisions of large corporate parents. Stout’s dedicated Real Estate, Lodging and Leisure practice serves clients across a variety of sectors including mountain, beach and golf resorts, leisure attractions, hospitality, marinas, cold storage, and Cannabis related companies. For more information, please visit our website at www.stout.com/industries/real-estate-lodging-leisure. GJEP is posting this release on behalf of our economic development partner, Powderhorn Mountain Resort. Please use media contacts below.